Extend your logic app's behavior with functions in Node.js or C#. Perform calculations in your logic app workflow. Apply advanced formatting or compute fields in your logic apps. You can also call logic apps from inside Azure functions. If you don't have an Azure subscription yet, sign up for a free Azure account. An Azure function app, which is a container for Azure functions, and your Azure function. If you don't have a function app, create your function app first. You can then create your function either separately outside your logic app, or from inside your logic app in the Logic App Designer. Your function app must have the same Azure subscription as your logic app. The HTTP trigger template can accept content that has application/json type from your logic app. 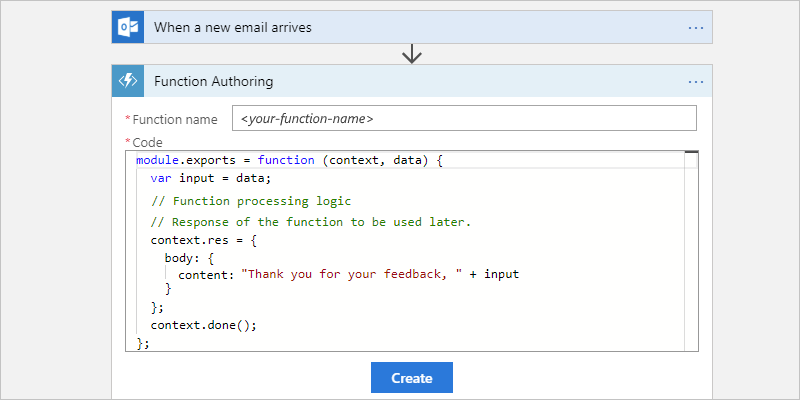 When you add an Azure function to your logic app, the Logic App Designer shows custom functions created from this template within your Azure subscription. Your function doesn't use custom routes unless you've defined an OpenAPI definition, formerly known as a Swagger file. If you've defined an OpenAPI definition for your function, the Logic Apps Designer gives you a richer experience for working with function parameters. Before your logic app can find and access functions that have OpenAPI definitions, set up your function app by following these steps. 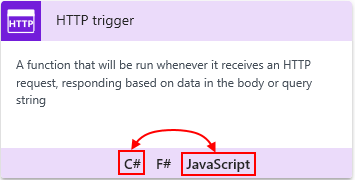 Before you can add actions that can run functions, your logic app must start with a trigger. If you're new to logic apps, review What is Azure Logic Apps and Quickstart: Create your first logic app. Make sure your function app is actively running. 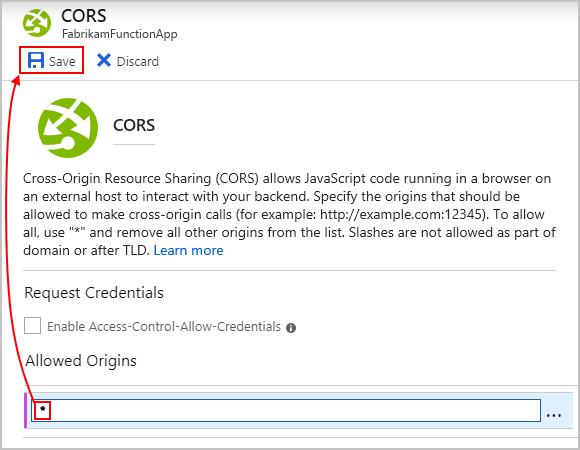 From the Function Apps list, select your function app > Platform features > CORS. Under CORS, add the * wildcard character, but remove all the other origins in the list, and choose Save. 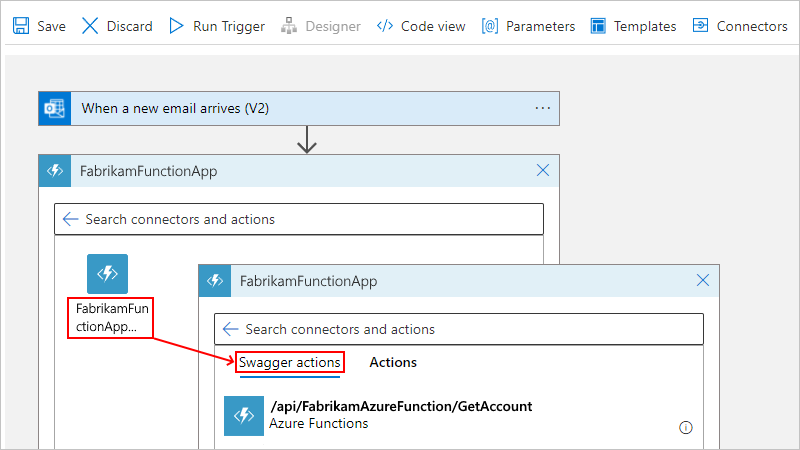 Now that you've created your Azure function, follow the steps for how to add functions to logic apps. Before you can create an Azure function starting from inside your logic app in the Logic App Designer, you must first have an Azure function app, which is a container for your functions. If you don't have a function app, create that function app first. 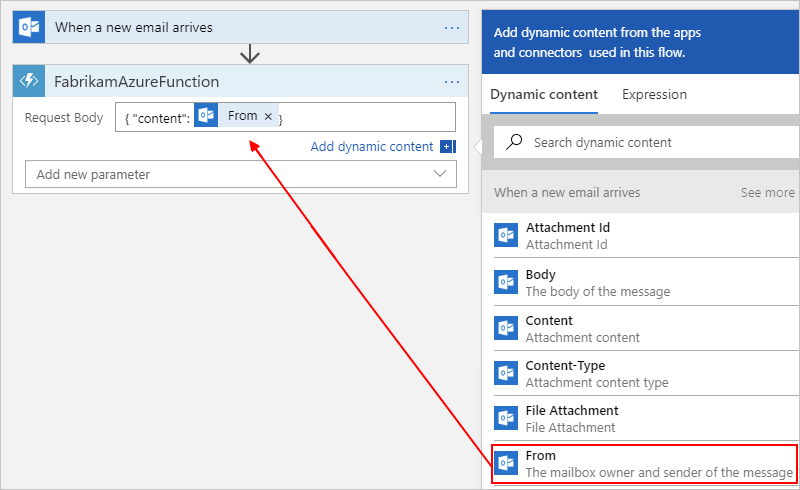 See Create your first function in the Azure portal. In the Azure portal, open your logic app in the Logic App Designer. Under the last step in your logic app's workflow, choose New step. Between existing steps in your logic app's workflow, move your mouse over the arrow, choose the plus (+) sign, and then select Add an action. In the Function name box, provide a name for your function. In the Code box, add your code to the function template, including the response and payload you want returned to your logic app after your function finishes running. The body property here applies to the context object and isn't the same as the Body token from an action's output, which you might also pass to your function. To specify other details such as the method to use, request headers, or query parameters, choose Show advanced options. 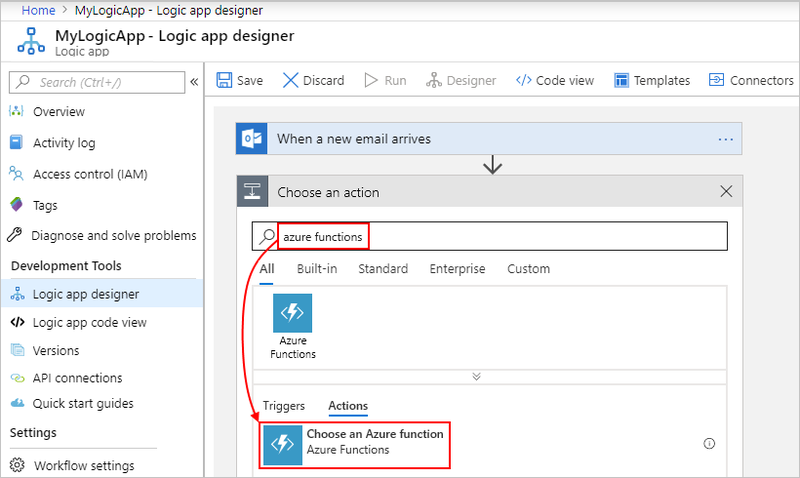 To call existing Azure functions from your logic apps, you can add Azure functions like any other action in the Logic App Designer. Under the step where you want to add the function, choose New step > Add an action. From the function apps list, select your function app. After the functions list appears, select your function. When you want to trigger a logic app from inside an Azure function, the logic app must start with a trigger that provides a callable endpoint. For example, you can start the logic app with the HTTP, Request, Azure Queues, or Event Grid trigger. Inside your function, send an HTTP POST request to the trigger's URL, and include the payload you want that logic app to process. For more information, see Call, trigger, or nest logic apps.